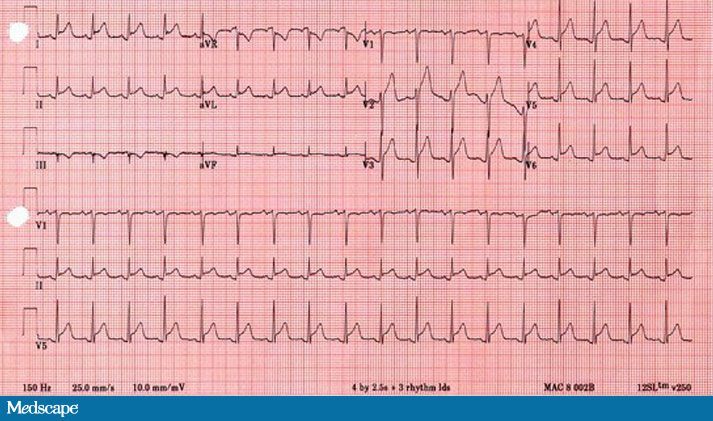 A 42-year-old man presents to the hospital with dull, anterior precordial and retrosternal chest pain that began acutely with a tearing sensation and has lasted for 3 days. He states that during this period he has been unable to “get comfortable”. The intensity of the pain increases during inspiration and with body movement. The patient denies any symptoms of recent viral infection, and he has received no recent vaccinations. He has no reported history of hypertension, coronary artery disease, prior cardiac surgery, diabetes mellitus, or hyperlipidemia. He has no family history of cardiovascular disease. The patient is taking no prescribed medication, over-the-counter medication, or herbal remedies, and he denies illicit drug use. The patient is alert but appears uncomfortable. He is afebrile. His blood pressure is 160/102 mm Hg in all extremities, with equal and symmetric pulses in both carotid and brachial arteries. His pulse is 103 bpm and regular. The cardiac examination reveals an early diastolic murmur in the aortic region, with no gallop, pericardial rub, or knock; however, the heart sounds are slightly distant. The patient’s lungs are clear to auscultation. The abdominal findings are unremarkable. The patient’s cranial nerves are intact, and no neurologic deficits are noted. An electrocardiogram (ECG) is obtained. Serial cardiac isoenzyme tests demonstrate no evidence of myocardial injury.